Despite changing offensive coordinators during the offseason, Ole Miss landed some key offensive talent through the December early signing period and on National Signing Day yesterday. Undoubtedly, the biggest news for Ole Miss on Wednesday came with running back Jerrion Ealy’s announcement that he’d join the 2019 Rebel class. Ealy is the highest-rated prospect the Rebels landed in this recruiting cycle, and keeping him in this class after his de-commitment in January is big for Matt Luke’s perception and “Mississippi Made” mantra. The wrinkle in Ealy’s signing with Ole Miss is that he is also a highly-touted baseball prospect. Ealy is projected to be a high pick in the MLB Draft this summer, and whether or not he ultimately sets foot in Oxford will hinge entirely on whether or not he chooses to go pro on the diamond. If Ealy winds up at Ole Miss, he’s expected to be a two-sport athlete and play for Mike Bianco’s squad next spring. Regardless of what Ealy chooses this summer, he is a Rebel for now, and Matt Luke needed this signing to help regain some momentum in Mississippi after missing out on linebacker Nakobe Dean in December. The Rebels are tasked with replacing numerous key cogs of their 2018 offensive attack, including wide receivers A.J. Brown, D.K. Metcalf and DaMarkus Lodge. Rich Rodriguez’s offense will also feature a new quarterback taking over for the graduating Jordan Ta’amu — presumably Matt Corral — and numerous new faces on the offensive line. Despite presumably having its answer at quarterback for the foreseeable future, the Rebels landed three signal-callers in the 2019 recruiting class, two of whom hail from the Magnolia State. John Rhys Plumlee, a two-sport athlete from Oak Grove High School in Hattiesburg, plans to play both football and baseball at Ole Miss and will provide depth to the quarterback room in Rich Rodriguez’s offense. After Phil Longo departed for the offensive coordinator position at North Carolina, many speculated as to whether or not quarterback Grant Tisdale would hold fast to his Rebel commitment. However, in the early signing period in December, Tisdale donned the red and blue and enrolled at Ole Miss in January. He, like Plumlee, will provide much-needed depth at the quarterback position. Another running back signee the Rebels landed, Jarod “Snoop” Conner, is a native of Hattiesburg and played quarterback for the Hattiesburg Tigers in high school. Conner utilized both his feet and arm in high school and could prove to be a valuable asset in Rich Rodriguez’s scheme. Conner, like 11 other Rebels, enrolled at the university in January. One of the biggest concerns with Ole Miss’s offense is the amount of generational talent that is headed for the NFL Draft in April — specifically at receiver. While it remains to be seen if any of these signees — or any receivers who are already on the roster — can replicate the success of A.J. Brown or D.K. Metcalf, the Rebels signed a hearty class of wideouts that should show production on the field. Some became wary of Jonathan Mingo’s commitment to the Rebels as he took official visits to other SEC schools leading up to National Signing Day, but ultimately, Mingo held fast and will enroll at Ole Miss in the fall. After losing numerous offensive linemen following the 2018 season, Ole Miss snagged seven players to fill the holes in the line. 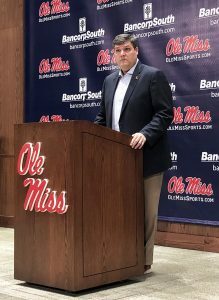 With Matt Luke being a former offensive line coach and seasoned coach Jack Bicknell now leading the unit, the Rebels should rarely want for offensive linemen on the recruiting trail. Ole Miss is losing another generational talent at left tackle to the NFL Draft, however, in Greg Little, and his shoes, along with those leaving due to graduation, will be difficult to fill. Still, landing seven offensive linemen in one class is impressive, and Rebel fans should feel optimistic about Luke and Bicknell getting the most out of these three- and four-star recruits.